I don't know about you, but I have been pretty confused when it comes to coffee. Is it good for you? Is it not good for you? Every day there seems to be a different study coming out arguing one thing or another. Should you avoid it altogether or is a cup or two ok or even beneficial?! The main question is really around caffeine, a pretty powerful substance which seems to have varying effects depending on the stage of life you are in and how much you’re drinking. ONE: if you are trying to conceive, and particularly if you have PCOS or very long cycles, drinking it in moderation can actually potentially be helpful (yeah...I was surprised too!). TWO: if you are already pregnant, the guidelines published by the WHO (World Health Organisation) who state that no more than 300mg (approx 3 cups/day) and the EFSA (European Food Safety Authority) who state no more than 200mg (approx 2 cups) is ok to consume - may even be too high and in fact, it seems that you should drink less than that and ideally none at all. It also has quite meaningful effects on our hormones…. What happens if I am trying to get pregnant? One of the more interesting bits of recent research has focused upon the impact of caffeine on testosterone. As a reminder, this is not just a hormone that men have, in fact, when it is out of balance in women it can be a signal of Polycystic Ovarian Syndrome (PCOS) which is one of the main causes of infertility and is often undiagnosed. Click here for more. One of the common features of PCOS is testosterone being higher than it should be which causes many things but specifically can cause issues with ovulation (ie. eggs not being released: anovulation) which of course makes getting pregnant a bit tricky! There was even an observation between this and the incidence of twins! On many levels soft drinks and particularly caffeinated ones (like energy drinks) should be avoided - here is another one. Key takeaway: If you are trying to get pregnant there appears no harm in moderate caffeine intake as long as it is not from a soft-drink. In fact, if you have PCOS moderate caffeine intake may even be a good thing. Of course we all react differently so always listen to your body. Moderation is of course the key thing here, particularly as too much caffeine has been shown to activate the stress axis within the body, acting to increase cortisol secretion by elevating production of ACTH at the pituitary. (5). If we know one thing about conception it is that if the body deems it is under threat (too much cortisol) then it will not dedicate the energy to allowing conception to take place. Click here for more on this. So, what about if I think I may be pregnant or am pregnant? Now the mechanism behind how this works is not entirely clear, although there is some suggestion of an impact on placental blood flow, however several studies support an ‘increased risk of experiencing a spontaneous abortion (SAB) with increased coffee/caffeine during early pregnancy’ and ‘recently, a meta-analysis reported than an increment intake of 100mg (ie. one cup) caffeine/day was associated with a 14% higher risk of SAB.’ (4) which is why even having two cups a day may not be such a great idea. Key takeaway: if you are pregnant why risk it? Yes, it can be a hard habit to break, however there are lots of other options these days for drinks that don't contain caffeine and it is only a few months of your life. Going cold turkey can be hard, particularly as for a lot of us our cups of coffee are also based on habit, so instead finding a substitute can be helpful and experimenting with lots of different options until you find the drink that is right for you. 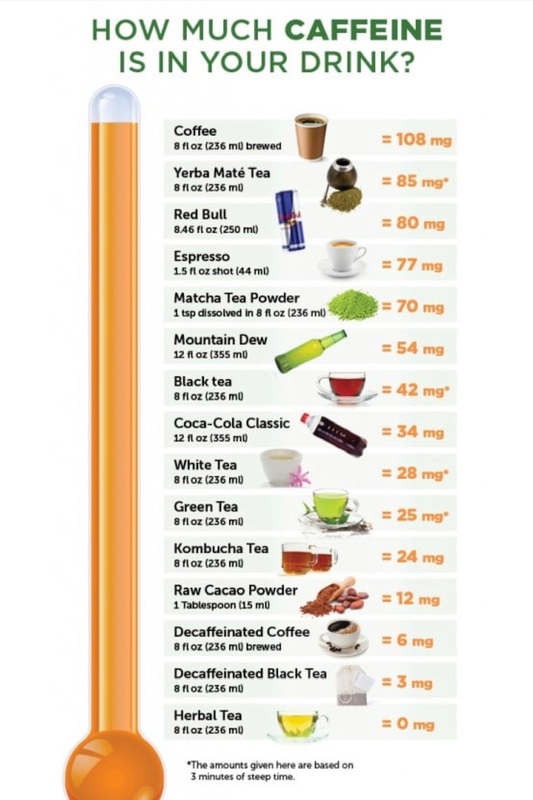 See below a quick sources of caffeine table (credit: hormonereset.com) that may be helpful if you’re trying to avoid!